The Lone Star Quilt is an old pattern known by different names. Besides Lone Star, people have called it Morning Star, Star of Bethlehem, Mathematical Star, and Star of the East. They are beautiful but can take a little skill to prevent the center from being too full to quilt and keeping the corners square. There are a lot of bias edges and y seams which can be tricky. Kathy made this Lone Star for her sister in law, and it turned out amazing. I had no trouble quilting it, because it laid down so nice and flat. She picked out really lovely fabrics for this lone star quilt. She followed tradition and had the colors radiate out from the center in rings. I love how she blended into the dark green right at that point where the star points separate out from the center body of the star. It produced a striking dark green circle to enclose the brown center spot. And then she blended back to brown in the points. Kathy also used a solid for the background. Not only did the star really stand out, but the quilting design really shines as well. When she dropped off her Lone Star Quilt, she didn’t have a backing for it. As many of you know, we sell over a hundred different wide back fabrics, so we were able to help her pick out the perfect fabric. She chose a fabric from the Holly Woods line from Moda. This color is Snow. It is a soft tan fabric that is covered in tiny little dots and asterisk style stars, or snowflakes. It is subtle and looked amazing with her quilt. She left this top with me to quilt with an edge to edge design called Wisteria. I used the Intelliquilter to quilt it, but this is a paper pantograph design that we sell in the shop too. It is a beautiful leaf design with some gentle swirls. 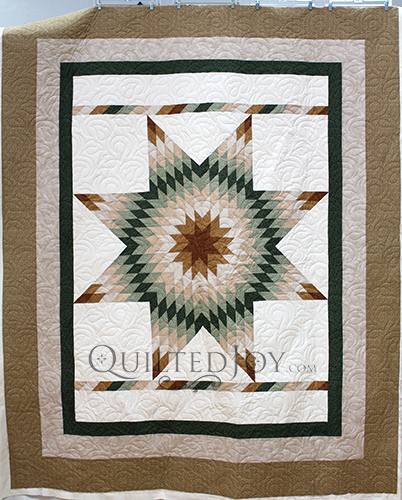 It added a little movement to the straight lines in this Lone Star Quilt. I love this design because of its evenness. Some designs can have gaps in them when it is stacked row on top of row. I can offset the rows, but that doesn’t always remove the gap. So I shrink designs to make sure those gaps are not too large. But then the quilting can become too tight or dense. Wisteria is lovely because it interlocks so nicely without those odd gaps. I can shrink or enlarge the design to fit the piecing and style of the quilt, and not because I have to for the structure of the quilt. The pride we feel when we have completed a difficult task is very satisfying. Lone Star quilts can be very challenging. Creating one that lays down flat and looks as good as Kathy’s Lone Star quilt can give you a tremendous sense of pride. I look forward to seeing what Kathy creates next. Next post: Don’t Forget the APQS Road Show is This Saturday April 13!